This is my first ever batch of marmalade! It turned out quite nicely, I’m happy with it. Lots of fun to photograph that’s for sure. The process was simpler than I thought, and though it takes 48 hours to prepare it’s mostly just allowing things to sit for a few hours at a time. Not difficult. Now all I need is some crusty bread! I’m really liking this canning idea, I can’t wait for summer so I can start pickling some fresh local vegetables and preserving some fruits. Non-perishables! -Place the oranges and lemon in a large pot, cover with the water, bring to a boil. Turn down to medium heat and simmer for 90 mins. -Put a lid on the pot, put aside, allow the oranges to sit overnight in the water so the skins become a nice buttery texture. -The next day: cut the oranges and the lemon in half crosswise, and using a spoon gently scoop out the insides/pulp and place this pulp back into the water. -Bring this pulp water to a boil and then turn down to a simmer. Allow to simmer for 30-40 mins while you slice the reserved peel into strands (or whatever shape you want, really). 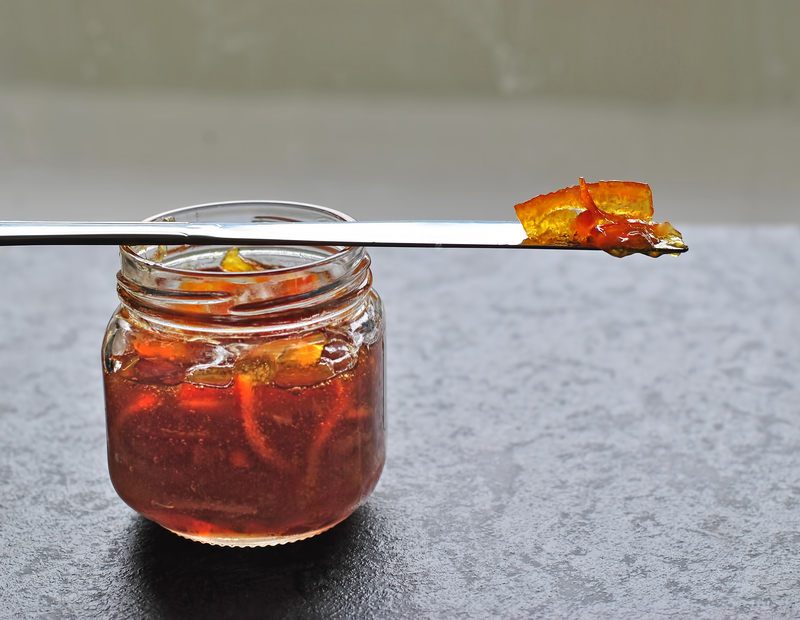 What you are doing here is extracting the natural pectin from the orange guts, this is necessary for helping the marmalade set after being cooked. -Once the pulp water has simmered at least 30 mins start putting clumps of it into a fine mesh strainer, and push and squish until you have a mostly dry pulp mass leftover. You will discard the pulp mass and reserve the juices and water. -Place the sugar and your diced/sliced orange rind into the pot of water and juices, bring to a boil, reduce heat to low/medium so you have a nice simmer going. Allow this mixture to cook for over an hour, it needs to reach about 104 celcius, or you can just cook it and test a spoonful of juices onto a cold plate placed in the fridge for 2-3 mins: if you can drag your finger through the blob and it holds it’s shape without spreading back out… it’s ready. 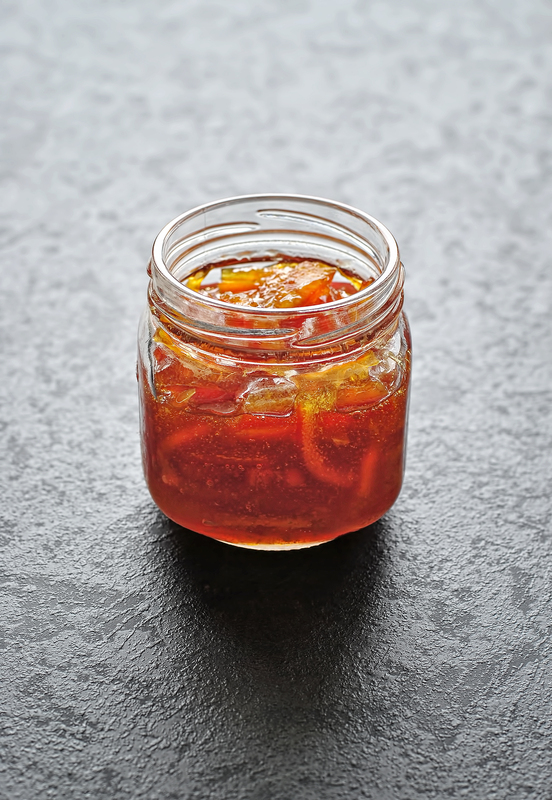 -Allow the mix to cool for a few mins so you don’t burn yourself, and transfer it into mason jars to be kept refrigerated, or follow the canning method here if you want to keep it in the pantry for up to a year. Much easier than it sounds, just need a little time to hang around the house to keep an eye on it! And… it doubles as air freshener for your home for the day. Beautiful! Definitely want to give this a try! Thank you very much, glad you like!